Mary still remembered the very first time during their courting days when David took her home to meet his large family. She recalled the warm and inviting house where noisy laughter echoed throughout. She’d been overwhelmed by them all at first but gradually blossomed as she was welcomed into a household that lived each day as a joy, embracing and celebrating every moment. She frequently used to admire her mother-in-law’s tea service which adorned her sideboard only being brought into use on the most special of occasions such as birthdays, christenings and Christmas. 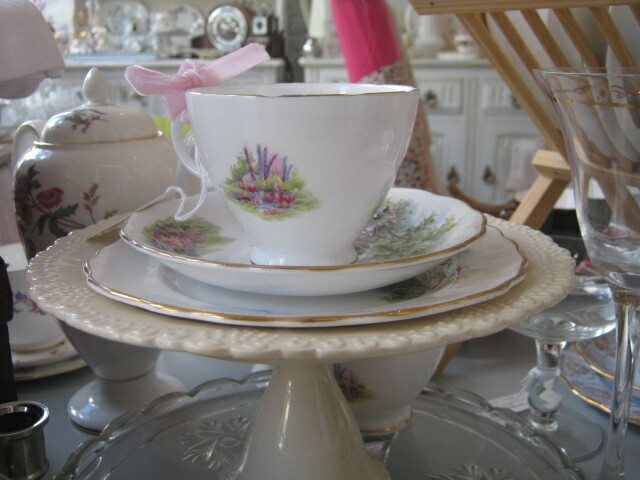 Each delicate cup and saucer had a gold leaf glaze and decorated with an array of cottage garden flowers. When Mary had first seen them she’d been enchanted with their fragile beauty. As a child her resentful family had never had any money for such luxuries and mocked those that spent their hard-earned cash on things that weren’t either functional or edible. As the years progressed one or two of the porcelain cups had been chipped by inquisitive grandchildren or lost their handles when dropped during over rigorous dishwashing but their appeal never diminished for Mary. It was true these tea-cups had witnessed a lot of happy and sometimes sad times but even when her mother-in-law moved into sheltered housing after her husband passed she wouldn’t part with the one remaining cup and saucer. As far as she was concerned it held a cupful of golden days and loving advice in every sip. Most of her family apart from Mary couldn’t understand her attachment to the past or such a kitsch item and would have assigned it to the dustbin had she not been so insistent. When eventually her beloved mother-in-law succumbed to pneumonia she’d bequeathed her beautiful tea-cup to her and as Mary gingerly unwrapped them from the newspaper surrounding the delicate china, tears rolled down her cheeks as she recalled her adored mother-in-law’s generous and kind spirit. She gently turned the fragile cup over in her hands, the porcelain so fine that it was almost transparent and thought about all the treasured memories that she was holding in her palm. At the bottom of the box was a note in her mother-in-law’s beautiful copperplate handwriting which simply read “come & share a cup of tea, my home is warm, my friendship’s free”. She smiled through her tears as she celebrated her mother-in-law’s life in the only way she knew how; by having a cup of tea. As she sat at the scrubbed kitchen table overlooking the garden she nursed the warm amber nectar in her hands and it comforted her just as her mother-in-law had done in life. How utterly lovely and dear. Thanks for writing and sharing. I have SO much china, all my mother’s wedding set, 8 piece serving set, plus another rose set, and I never use them. I also have a one cup English set like above with saucer and biscuit plate. I just need someone to share my tea with! I love tea. Lovely Tink and reminds me of my own gran who shared her welcome wisdom to any who’d listen, over a good cuppa tea. Ahh this is beautiful. Sentimental and always timely. Nothing better than pretty English tea cups. The picture is precious. The phrase “sheltered housing” sounds so much cozier than our “assisted living”… almost like the difference between tea and coffee, I suppose. There was something delicate in the writing, just like in the lovely cup used to make us see. Lovely story. What a beautiful story. Simple and has its way to one’s heart. A very moving story indeed, Dallas. I have a few of my mother’s treasured possessions, but my sister has all of her china. It was nice to eat from it whilst I was over with her for the memorial. What a lovely story! You know in my family we don’t pass down tea cups. We pass down shot glasses. Now why am I not surprised! Is there a special glass for skinny Pirates? Oh absolutely. It’s even bedazzled.